This Beautiful Dream Pillow is Hand Made and filled with a blend of Herbs and Essential Oils including Lavender to Soothe and Relax and Lemon Balm to evoke more Vivid Dreams. I have also included some tiny pieces of crystals, Rose Quartz for releasing stress and Amethyst which will bring a state of balance and peace. 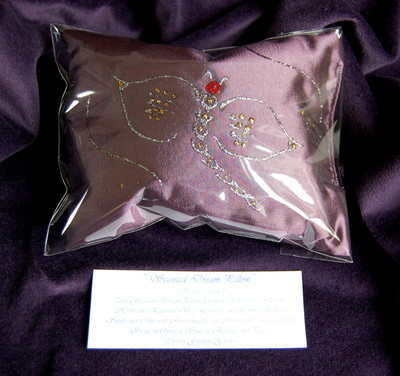 The Pillow is 5 1/2" by 4", comes in its own cellophane bag to retain the aroma and has been Hand Decorated with a Lovely Dragonfly motif.